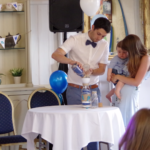 Last month in a naming ceremony I conducted we used a Unity Sand Ceremony. It demonstrated how mum, dad and baby were now blended together in family life. 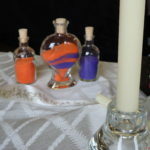 Three small bottle of sand, each a different colour, represented each member of the family. Half of each bottle was poured into a larger bottle, forming visible layers of the colours. This represented the individuals, whose uniqueness could still be seen. Then the rest of the sand from each of the three bottles was poured together into the funnel to fill the larger container. 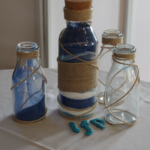 We recognised that just as the sand from each individual bottle could not be separated back into the individual containers, so each individual would be affected by being part of this family. Our wish for the family on that day was that they would be together, in love, for longer than it would take for the individual grains of sand to be separated. 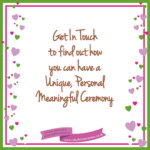 Sand ceremonies are also very special as part of wedding ceremonies. They demonstrate the unity of the couple in a very visual way. Where children are involved, either those of the couple together or coming into a blended family, different coloured sands can be used to represent the children. Parents of the couple getting married can be involved in a sand ceremony. This gives a demonstration of the heritage of the new family going forward. All of the colour that created the individuals can be seen joining together on that day. In a religious ceremony the bottom of the unity container is often covered with another colour demonstrating God’s love as their foundation. In the words of the sand ceremony individuals are often reminded of all of the gifts and graces that they each bring – represented by the separate colours. Then the beauty of the new relationship which calls on those individual gifts and graces is recognised. One beautiful ceremony I loved had a couple bring sand from two different beaches Special to them. They used jugs to pour the sand through a paper funnel into a Mason jar. Simple but effective. 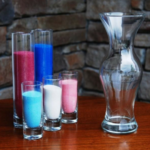 It is also possible to get lots of different coloured sands and to buy personalised pouring vessels and containers. The coloured sands can be chosen to meet the wedding colour scheme or as the favourite colours of all taking part. Whatever you choose, a sand ceremony can be a fabulous, powerfully visual illustration of your new relationship. It also provides a special keepsake to put on display in your home.